Broken line? Cracked phone? Mechanical problems? No worries—we’ve got you covered! With the Ritter Protection Suite, you can safeguard your important data, devices and wires from damage and avoid unexpected costs for one low monthly price. 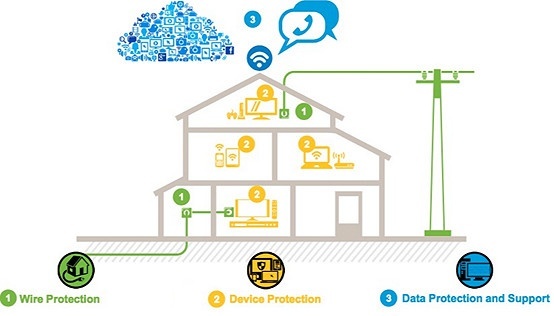 Learn more about adding device protection, data protection or wire protection separately. Repairing or replacing a single cell phone can cost hundreds of dollars. GUARDware device protection offers protection for your phones, televisions, tablets and more! Our device protection covers repairs or replacements for accidental damage on a variety of devices*, as well as mechanical or electrical breakdown. Plans start at just $9.99 a month! *Eligible electronics must have been purchased within the past 3 years of registration. Click here for full terms and conditions, including exclusions and limitations. Your safety is important to us. Our TechHome plan protects your personal data from hackers and internet viruses that can harm your files. Plans start at just $5.95 a month! Did you know the hourly rate for repairing damaged cable in your home can be as much as $75 an hour? Ritter’s wire protection is like insurance for all the wiring in your home. Plans start at just $3.99 a month!